Redwood is beautiful and naturally stable with an open cell structure to resist warping. It contains little or no resin and pitch which enables it to retain finishes extremely well. 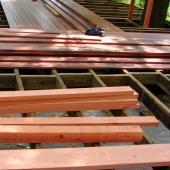 Redwood is one of our most renewable resources but since it is a natural material we recommend that you finish your deck with the minimum of a semi-transparent stain and keep a regular maintenance schedule. 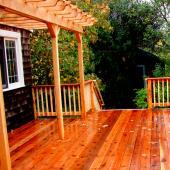 We use construction heart redwood which limits the sapwood that can cause a natural deck to deteriorate more quickly. Redwood is a lower front end cost but it needs to be maintained and fastened with proper decking screws. 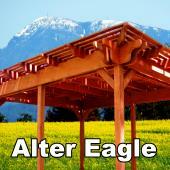 We prefer to use it for railings and pergolas. In a vertical orientation it is an excellent material that is cost effective. 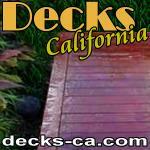 When installed correctly as decking and maintained 2nd growth redwood will still last a significant number of years. We don't recommend allowing 2nd growth to weather without sealing it from the elements. 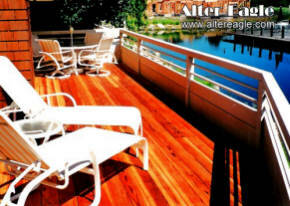 Our composite decking preference offers surface technologies with unsurpassed stain, fade, scratch and mold resistance. 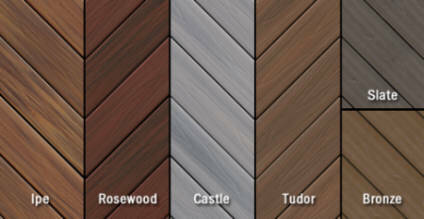 Fiberon has several advantages over most species of wood, it won't crack, splinter or deteriorate. 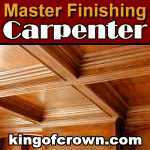 There's nothing to sand, stain or seal. 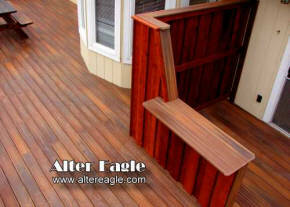 We can install it so the fasteners in the decking field are hidden so you won't see those unsightly deck screws. 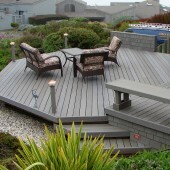 I used this decking at my own home. Fiberon is virtually maintenance free requiring only an occasional cleaning with soap and water so even with a higher up front cost composite decking is my first choice. We also suggest using it as a railing cap for it's superior protection. 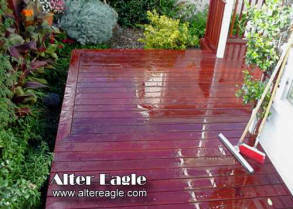 I think you'll be impressed with it's "golf ball" like scratch resistant, stain resistant coating. 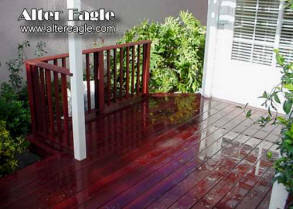 Fiberon composite decking is backed by the industry's first 20-Year Stain and Fade Resistant Warranty. Ipe is a Brazilian walnut and is one of the strongest hardwoods available, nearly twice as strong as oak. It's difficult to work and a bit costly but it is mildew, fungicide and termite resistant. The tight grain means no slivers and it has no knots. 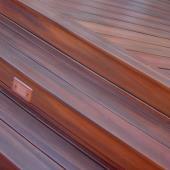 Ipe and Massaranduba (Brazilian redwood) are our favorite hardwood decking and teak for exterior furniture material. 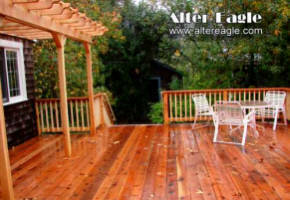 An extremely durable and long lasting decking from managed forests is the top of the line choice. These hardwoods don't require a finish but to keep their beautiful look and bring out the grain a transparent penetrating oil-based sealer with UV inhibitors in a trans-oxide pigment are recommended. We also recommend using stainless steel screws or if budget allows, a blind fastening system.